This, Thread #3, went out to nearly 300 people today — if you’re new, have a look at Thread #1 and Thread #2 to see where this is all coming from. More exciting things on soniverse.space and other things next time! But, in this Thread I’m going to talk more about specific outputs and impacts. Inspired by the web and based on evidence, Constellations are federated partnership programmes that turn social, environmental and economic impact into business as usual. We help deploy capital, humans and machines to address today’s challenges at scale. I hope it will become clear how the dots herein join together into the bigger picture of impact. I’m even going to talk about banking — please bear with me as it has a point and is more exciting than it might sound. It’ll take no more than 10 minutes to read everything. 1. Can government stop losing its mind? 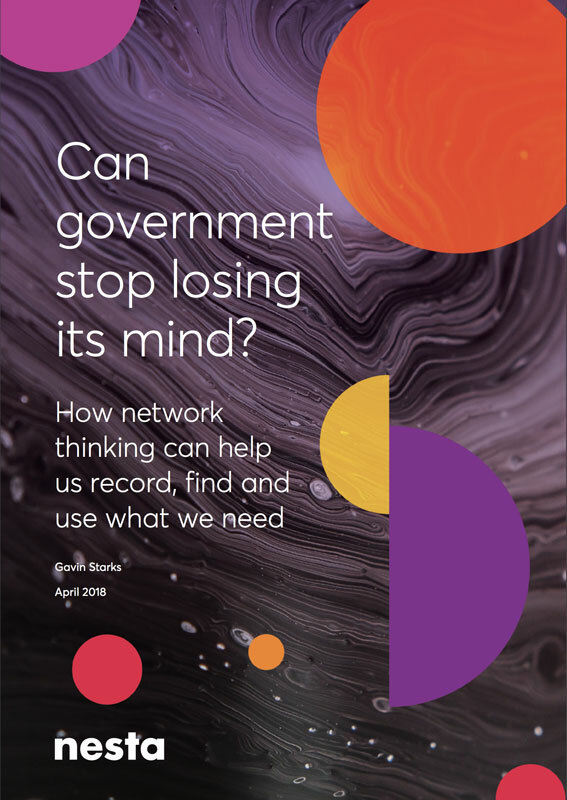 I finally launched my report Can government stop losing its mind? which asks how we might use all this amazing tech we’ve built to actually recall what we already know. It makes five recommendations and then goes into detail about what multidisciplinary teams are needed to deliver them. On launch day serendipity played its (often) surreal role in the things I do — BBC Radio Five linked the Windrush scandal (which broke on the same day) to my report, giving Geoff Mulgan a good spot to discuss it. It’s led to good conversations about how we might inject different kinds of thinking into how institutions work. During a recent lunch conversation about how [tech buzzword] might change the world, we all acknowledged that it’d taken a fairly Herculean effort just to coordinate calendars to get us all to lunch: that interoperability was always much harder than we realise and that, given we’ve been trying to do this at-scale with the web for over 25 years, maybe we should be a bit more skeptical about anyone’s ability to use [AI, machine learning, blockchain, the web] to bring about world order. Maybe a more balanced perspective is to consider that “Uber is a below-cost taxi service subsidized by tens of billions of dollars of venture-capital funding” rather than the (somewhat ludicrous) hypothesis that “AI will spell the end of capitalism”. Second up is another intervention based on serendipity. 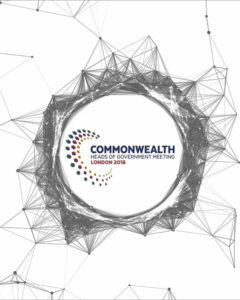 At the 2015 Commonwealth Heads of Government Meeting (affectionately known as ‘CHOGM’) I was a bit alarmed by the lack of discussion about any kind of digital agenda, so asked the question – it turned out, to CWIEC Chairman, Lord Marland – “What’s your digital strategy?”. In January this year the Open Banking Standard, which I co-chaired development of, became regulated in the UK (I also named it — but ask me about *that* story over a beer). These are significant (ie. generation-impacting) changes and if you are interested in data, or business, or the web, or money, or people, they are worth learning about. The framing of the Open Banking Standard and Brexit is also interesting here. The Commonwealth was (amongst other things) designed to help remove friction in trade, create common law and common language. If we want to do that in a digital age, what’s been done in Open Banking would be a really good starting point. Of course we’ve been pushing this idea already (without the Commonwealth banner). 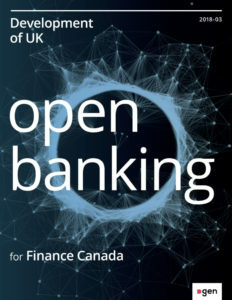 Constellator Cynthia has done an absolutely amazing job of engaging the Canadian government and we’ve just published an (internal) report for them on how the Open Banking Standard emerged in the UK — so they can work out how to copy it. I’ve also been over in New Zealand where Payments NZ have been doing amazing work to create an industry-led initiative: copying “about 80% of the UK standard” and focussing on service innovation. This word ‘copy’ is quite important here: it is possible because we made the UK standard open. Even the code being developed is being made open. As a result, we may be seeing the idea of a global open banking standard emerge and catch hold: the competitive angle is not in the code: it’s in the delivery of services underpinned by robust policies. And why is this exciting? It’s not about tech, it’s about culture. If the banks and government can get their acts together and create policy and processes that deal with your personal and business data better, that’s good for everyone. If it’s all open and everyone else can see what’s going on, copy it and build on it, that’s unlocking potential for global transformation. But, that’s not where this story ends, it’s where it begins. A House of Lords select committee has called on NHS England “to urgently develop a consistent and rigorous approach to data sharing agreements, so as to put the NHS in a position to tap the value of AI initiatives in healthcare”. This echoes what I’ve long been saying: that it’s pointless jumping on the AI/ML/BC/etc bandwagons until we’ve sorted out our data infrastructure. Open APIs, open metadata, open data and a clear understanding of data licensing will mean we can access, use and share with confidence. The alternative will be garbage-in; garbage out. Constellator Tina has been doing a great job of trying connect the disparate groups already working on this in Digital Health & Social Care, including hosting a workshop and writing a report on its outputs. Beyond disclosure, what do companies, cities and other owners of climate risk need to act on their risk? Could we design an insurance policy that gets cheaper when policyholders have taken steps to reduce their climate risk? What is needed to pre-finance or speed up payout against anticipated and forecasted disaster losses? Could preparing for insurance claim surges speed up recovery? What could public stakeholders design with access to the best granular information about disaster and climate risks? Are there new applications of technology that may help increase efficiencies in the sector? To that end we’re exploring the creation of an Open Environmental Risk Standard. So the stars, many as they are, seem to be working out some of their physics: I think we’ve worked out the one-liner (at the top) about what Constellations do. We’re building a tiny MVP of a tool to connect us all (you’ll get an invite when it’s ready, it’s not a yet another chat tool). We’ve got a few emergent prototypes. Dgen Constellations are a ‘many-parts-loosely-joined’ network comprising dozens of specialists and experts with deep commercial, startup, government and NGO experience who have worked at international, national and local levels. We bring together dedicated experts to deliver specific outcomes against a fixed deadline and budget. Unlike a consultancy, we’re not here just to ‘point’. Unlike an agency, we’re not here to retain you as a client beyond our useful impact. We are here to help achieve a 10x return on investment with social, environmental and economic impacts. We are unashamedly ambitious…and acutely aware of the challenges. And what next? Well, thanks to super-connector Constellator Natabara, we went to New York to meet their Head of Partnerships. We’re just in the process of writing up how to apply the Constellation principles to tackling the Sustainable Delivery Goals (SDGs). Thanks to input from several of you I’ve decided that, of the various flags we could raise around ‘issues’, these are well-framed calls to action and we will galvanise people around them. And certainly the startups and companies I’m helping in the background (Cupclub, Provenance, Blue Ventures, TISCreport, OpenCorporates and others-to-be-announced) are all huge parts of the future systems design. If you know any organisation that would benefit from being part of this emerging network, please let me know. In closing out this edition, I wanted to reflect on the rattling ‘world-changing’ noises that [insert tech memes here] keep hitting all our feeds with. For every single ‘blockchain will destroy capitalism’ or ‘AI will bring about communism’ post, I go and check out who’s running the companies behind them. You can guess what I find: in nearly every single case there are a near-100% team of white, male experts in them. Aside from this being continuously ridiculous, I cannot take any operation seriously that says it’s somehow going to change the world, when the same-old structures are designing that change. If we fail to diversify, we’ll create the same outcomes again. This has nothing whatsoever to do with technology. 5. Click click click click click click click — you know you want to, go on click them all. That’s what tabs are for. “We often confound Science with Civilisation, and Art with luxury.